Bravante Vineyards is located on beautiful Howell Mountain. We are a family-owned boutique estate winery producing small-lots of hand-crafted, premium wines. Cabernet Sauvignon, Cabernet Franc, Bordeaux Blends and our multi Award-winning Howell Mountain Estate Merlot. We are open daily by appointment only, from 10 am - 5 pm. Our winery is nestled between two caves, dug out of the rocky, Howell Mountain, hillside. One cave is where our wines rest in barrel until they are ready for bottling, and then aging some more, before release to the public. This additional bottle aging is an additional unique benefit we afford our guests and winery supporters to insure that they receive our wines at the start of their perfection plateau. The other cave, on the other side of the winery, is purpose built as our hospitality venue and creates a wonderful environment for tasting and education. In front of our barrel aging cave, overlooking the wild Howell Mountain hillside, above our year round, spring fed, pond we provide a beautiful area to picnic alongside a grassy event area. If you watch close you will likely catch a glimpse of the deer and other local wildlife that we share our beautiful estate with. View from Tasting Room: Howell Mountain and the inside of our hospitality cave. Wine Education: We not only pour samples of our most current releases but also strive to educate about the unique character of Howell Mountain AVA as well as the even more distinctive Bravante Vineyards. Food Available: On request, we can arrange a picnic or cheese and charcuterie accompaniment to your tasting. 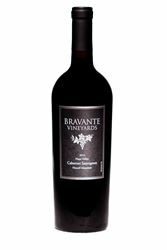 To join the wine club, visit www.bravantevineyards.com or call 707-965-2552. 2 shipments a year of 6 bottles each. Wine Club Members enjoy industry insider preferred pricing that is 30% less than normal retail on all purchases, free tours and tastings, and invitations to member-only events.